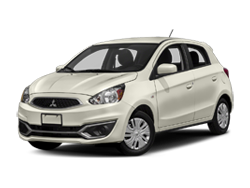 Comparative Automotive Research has identified no less than 17 advantages that the Mitsubishi Mirage has over the Hyundai Accent Sedan. Both the Mirage and the Accent Sedan feature Standard driver and passenger air bags. The Mirage is equipped with Standard FWD. The Mirage ES is protected by a Optional anti-theft system to help protect your investment against theft and break in. Anti-theft is Not Available on the Accent Sedan. The Mirage has a Standard rear spoiler, which creates additional downdraft at higher speeds, improving road holding ability. A rear spoiler is Optional on the Accent Sedan. Fog lights are Standard on the Mirage ES but they are Optional on the Accent Sedan. Fog lights are very effective at improving visibility in foggy and other difficult driving situations. According to the Insurance Institute for Highway Safety, multiple-vehicle daytime crashes account for about half of all police-reported crashes in the United States. Numerous studies have shown that daytime running lights - low intensity lights that make vehicles more visible during daylight hours - reduce daytime accidents as much as 11%. Mirage 37.3 in. 49 in. 34 in. Accent Sedan 37.2 in. 47.2 in. 33.3 in. The Mirage has 17 cu. ft. of cargo volume compared to 14 cu. ft. in the Accent Sedan. The additional cargo space means more room to store and transport packages, luggage, etc. The Mirage, with its higher minimum ground clearance, 6.3 in. vs. 5.5 in., is more capable than the Accent Sedan of traversing rough terrain without problems. The Mirage is shorter than the Accent Sedan , 148.8 in. vs. 172 in., so it will be easier to handle and maneuver. The Mirage comes standard with lower profile, 65 series tires (height to width ratio), which may provide better handling than the 70 series tires standard on the Accent Sedan. In addition to the obvious cosmetic benefit of alloy wheels, they are lighter than traditional steel wheels, providing better performance. Alloy wheels are Optional on the Accent Sedan but are offered as a Standard feature on the Mirage ES. The Mirage ES features a Optional navigational aid system, providing maps, driving directions and location assistance. A navigation system is Not Available in the Accent Sedan. The Mirage has a Standard automatic climate control system. The system controls the temperature, fan speed, and vents to maintain a consistent environment within the passenger compartment. Automatic climate control is Not Available in the Accent Sedan. On long road trips in the Mirage ES, drivers can engage the cruise control, reducing fatigue. Cruise control is Optional in the Accent Sedan.